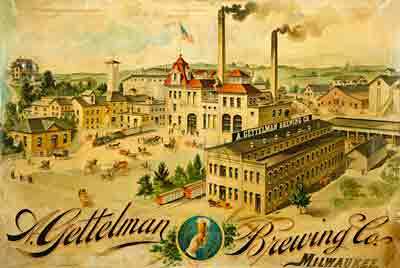 The A. Gettelman Brewing Company (1856-1961) was one of Milwaukee’s major industrial brewers. Although remaining a mid-sized brewer among the city’s giants, Gettelman was an important innovator of beer packaging and advertising and a significant acquisition in the expansion of the Miller Brewing Company. The Gettelman Brewing Company originated as George Schweickhart’s Menomonee Brewery, established near what is now 44th and State Streets in 1856. Coming from an established brewing family in Mühlhausen, Alsace, Schweickhart purchased a half-built brewery started by Strohn and Reitzenstein, who had both died in a cholera epidemic two years earlier. The brewery’s location in the Menomonee River Valley west of Milwaukee provided ideal access to clean water from nearby Wauwatosa wells, ice from the river, natural caves for storage cellars, and hops and barley from surrounding farms, while still maintaining easy access to Milwaukee and surrounding towns via the old Watertown Plank Road and later railroad connections. In 1871, Schweickhart brought Adam Gettelman on as a partner in his brewery. Gettelman was an apprentice at the brewery who had married Schweickhart’s daughter in 1870. In 1874, Schweickhart sold off his portion to his son-in-law, Charles Schuckmann, whom Gettelman later bought out to become sole owner of the brewery in 1876. Officially named the A. Gettelman Brewing Company in 1887, the Gettelman family remained in control of the brewery for three generations, until it was sold in 1961. Fire destroyed a significant portion of the original brewery in 1877, and Gettelman rebuilt and updated their facilities. Gettelman kept the brewery relatively small—just big enough for the family to manage and maintain a high quality product. In 1891, Gettelman introduced its flagship “$1,000 Beer” brand, offering a $1,000 reward to anyone who could prove that it was made with anything other than pure barley malt and hops. Gettelman also introduced its popular “Milwaukee’s Best” brand in 1895. Gettelman survived Prohibition making “near beer” and through several different investments outside of brewing, like the West Side Savings Bank, the development and manufacturing of snow plows, gold-mining in the American southwest, and a sugar beet processing plant in Menomonee Falls. Gettelman returned to brewing in 1933, with Frederick “Fritz” Gettelman as president. In order to counteract barrel shortages as brewing resumed, Frederick Gettelman personally designed the first practical steel keg in 1933, manufactured by the A.O. Smith Company of Milwaukee. Shortly after, he also consulted with the American and Continental Can Companies on how to apply his design to the development of what became known as the “keg-lined” beer can. In the late 1930s, he developed new glass-lined storage tanks, also manufactured by A.O. Smith, and a more efficient bottle-washing machine. The company introduced a new eight-ounce beer bottle labeled “Fritzie” in 1946, inspired by heinzelmännchen, the house gnomes of German folklore. By 1952, Fritzie had evolved into a cartoon beer bottle with a rotund face and Tyrolean hat that was famously featured in different humorous scenes painted on the exterior walls of several Milwaukee taverns. Moreover, the company became an important pioneer in television advertising in Milwaukee, sponsoring televised wrestling matches in 1947, and World Series pre-game shows in 1949. Gettelman Brewing also made major investments in modernizing and expanding their operations in the 1950s. They entered the Chicago, Boston, California, and other regional and national markets as they briefly opened in the wake of industry consolidation. Gettelman released a new, lighter “Milwaukee” brand beer in 1956, and began importing and distributing Tucher beer from Nuremburg, Germany in 1959—the first American brewer to establish such a relationship. Nevertheless, the company was unable to continue competing with the national giants, and the Gettelman family sold the brewery to the neighboring Miller Brewing Company in 1961. The Gettelman plant and brand continued on with brothers Tom Gettelman and Frederick Gettelman, Jr. as plant managers until Miller formally merged the two operations in 1971. Elements of the Gettelman brewery remain part of the Miller Brewing Company complex, and its Milwaukee’s Best brand lives on in Miller’s portfolio. ^ Nancy Moore Gettelman, The A. Gettelman Brewing Company: One Hundred and Seven Years of a Family Brewery in Milwaukee (Milwaukee: Procrustes Press, 1995), 1, 3. ^ Ibid., 1; Jerry Apps, Breweries of Wisconsin (Madison: University of Wisconsin Press, 1992), 206. ^ Gettelman, Gettelman, 1-2; Apps, Breweries of Wisconsin, 206. ^ Gettelman, Gettelman, 3, 7; Apps, Breweries of Wisconsin, 206. ^ Gettelman, Gettelman, 3, 11; Apps, Breweries of Wisconsin, 206. ^ Gettelman, Gettelman, 11; Stanley Baron, Brewed in America: A History of Beer and Ale in the United States (Boston: Little, Brown, 1962), 288. ^ Apps, Breweries of Wisconsin, 206; Gettelman, Gettelman, 9. ^ Gettelman, Gettelman, 13, 130-131; Apps, Breweries of Wisconsin, 207. ^ Gettelman, Gettelman, 13, 38. ^ Ibid., 141-147; Apps, Breweries of Wisconsin, 207; Baron, Brewed in America, 345. ^ Apps, Breweries of Wisconsin, 207; MillerCoors, “MillerCoors Beers,” http://www.millercoors.com/our-beers/great-beer.aspx, last accessed June 20, 2014. That information is still available at the MillerCoors website.